The following is the set list for both hours of Murphy’s Magic Mess on KZUM Community Radio in Lincoln, NE. This is taken directly from Spinitron. I’d like to know your opinion on the format of the listings. Please comment below. Thank you. 10:33AM-10:35AM (2:38) Those Damn Accordians “Grodno In the Moonlight!” from Squeeze This! * K8 celebrated her birthday recently and Murf and Phil tortured her with Hoppy Birdies early in the show. Sir Fluffy Bunny also dropped in on the Mess after *K8 ran away to brunch with her family. Michelle is under the weather and was unable to join the Mess. With the recent full moon and Mercury coming out of retrograde, the gang of the Mess thought it would be appropriate to use music that shares the balance of the moon. Featuring new music from various New Age and Pagan musicians as well as some classic pieces from Murf’s collection, this episode of the Mess brought you some fun and balance in this interesting astrological time. Tune in Sundays at 9am Central on KZUM for two hours of some of the best in New Age and Pagan music. 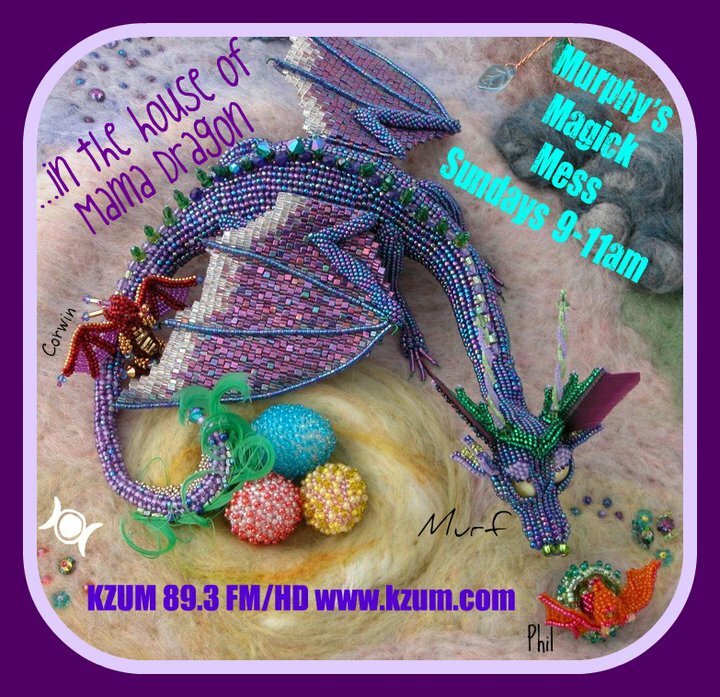 Murphy’s Magic Mess is the world’s longest running Pagan content radio program. Sunday 1 February 2015 was Murphy’s Magic Mess‘s Brigid’s Day show. Murf, *K8, Phil put together an amazing collection of Imbolc and Brighid music with a small set devoted to Manannan mac Lir and his stolen statue. Tune in on 8 February for a special edition of The Mess. KZUM‘s Spring Fund Drive began on Thursday the 5th. Murf and her Minions are putting together some of their favorites and some of the best of Pagan and New Age music. Might even have a surprise or two in store for the listeners! This week on the Mess we didn’t have a set theme. We just kind of threw music at the players and waited to see what stuck. Murf did have a small collection of music on her master, but other wise it was just a messy Mess. All fun and games, of course. Thank you to *K8 for typing up the play list. Phil made any necessary corrections to spelling. Michele was unable to sit in with us, but she did call to say hello. The creu of the Mess looks forward to her joining them again in the studio. KZUM is gearing up for their 37th birthday celebration. To do so they are opening up their donation page for the Spring Donation Drive 5 February – 12 February 2015. All donations are tax deductible. You can donate in advance of the drive by visiting the KZUM website and clicking on the Donate button or you can do so during the Drive. You can also call the station any time there is a live DJ at the boards or during normal business hours. Both through the site and the phone you can list your favorite shows or share any other comments you have for the station. Stay tuned to our FB page for details on our special premiums or check the KZUM site for normal donation premiums. Murf, *K8, Michelle and Phil were all around the table this morning for the second 2015 edition of Murphy’s Magic Mess on KZUM in Lincoln, NE. With a hodge podge of New Age, Pagan, and fun music and stories they shared their laughter, their time, and their joy with the listeners. A note to those who were listening, Yes by Bone Poets Orchestra did not actually play during the two hour time slot, it instead was the launch song for Lavender Hill as the musicians are a poly family and that fits right in with the general theme of LavHill on KZUM. Michelle is a “new” addition to the Mess. She is not officially a Minion yet, but she is getting some training on the boards and is encouraged to bring in some of her own music selections for use during the show. Michelle hails from the Order of the Red Grail, a local Wiccan church, and has been regularly guesting on the Mess for some time now. Murf recently extended the invitation to her to join the crue and make a Mess of things with the rest of us. Murf and her Minions are looking forward to get her trained on the boards and making her a permanent addition the Mess. KZUM is coming up on their Spring Donation Drive, one of the two or three times a year the station asks the listeners to donate and support community radio. The drive is from 5 February to 12 February 2015, in time to celebrate the 37th anniversary of KZUM. You can find more information at the web site. The Crue of the Mess will be sharing more information as it becomes available through their Facebook page and during the live broadcasts. This week on the Mess we celebrated both the Full Moon and honored the memory of those who died in the bombing of Pearl Harbor 73 years ago. Phil supplied the Moon music and Murf the Warrior music (with two exceptions in the Warrior set). *K8 handled typing up the original set list for posting to our Facebook page. Next week will return us to our usual format, featuring 15-45 minutes of NEW new age music in the first hour.